Bentonville, AR, February 14, 2019 --(PR.com)-- MagneSteps company, based in Bentonville, AR, is pleased to announce the release of their product - MagneSteps magnetic insoles. As a beginning, MagneSteps will be offered online in several Asian countries. Within couple of weeks the product will be spread in Europe and Africa. MagneSteps acupressure magnetic insoles are built to provide relief from foot pain, arch pain, spine pain, and even pain in muscles. Special buttons massage the leg while walking, thus stimulating the receptors, which results in significantly better blood circulation. The magnetic field penetrates very quickly into the painful tissues and prevents the electrical impulses causing pain. The strength of the magnetic field is specially adjusted to be effective, and, in the same time - completely harmless to the body. Product's technology allows the user to hold his feet in proper position. In this way, MagneSteps provides immediate relief of the pain of different origins. The insoles are made of high quality material, which does not cause excessive perspiration. 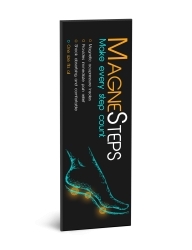 MagneSteps insoles are easy for use. First the user should place his foot on the insole to make sure what his fitting size is. Then, cut each of the insoles along the cutting line. Last - insert MagneSteps insoles in his shoes. MagneSteps official website has announced 50% discount for the first 100 clients who decide to try the acupressure magnetic insoles.